A milestone was created on Tuesday in Colorado when Rajan Zed, prominent Hindu chaplain and Indo-American leader, opened the Colorado State Senate with a Hindu prayer for the first time since its formation. 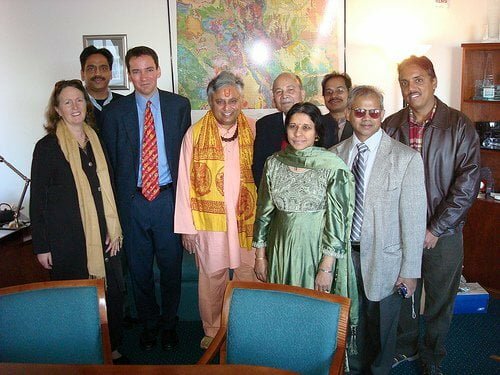 Rajan Zed (fourth from left) with Andrew Romanoff, Speaker of the Colorado House of Representatives (third from left) and leaders of the Hindu community of Colorado after the prayer. Sporting a ruddraksh mala (rosary) and traditional orange sandalpaste tilak (religious mark) on the forehead, Zed, after reciting the original lines in Sanskrit, then read the English translation of the verses. Sanskrit is considered a sacred language in Hinduism. After the prayer, Zed presented a copy of Srimad Bhagawad-Gita to Peter C. Groff, President of Colorado Senate, who introduced Zed. Andrew Romanoff, Speaker of the Colorado House of Representatives; Ken Gordon, Senate Majority Leader; Cary Kennedy, Colorado State Treasurer; whom he met after the prayers, personally welcomed and thanked Zed for the opening prayer. Zed was accompanied to the Colorado Senate by Ved P. Nanda, Vice Provost of University of Denver; Sridhar Talanki, Trustee of Colorado Telugu Association; Sudhir Verma, Trustee of Hindu Temple and Cultural Center of the Rockies; Sridhar Ponnapalli, General Secretary of Colorado Telugu Association; Katherine Nanda, attorney; Mohan Ashtakala, publisher of The Himalayan News newspaper and his wife Radha. “This is a great day for Colorado and a historic day of honor for us,” Zed said at the start of the prayer. The prayer was well received in the Senate where everybody stood silently with heads bowed down. Rajan Zed created history on July 12 last when he opened the United States Senate session in Washington DC with Hindu prayer for the first time in its 218 years history. He has also read first Hindu prayers in California, Nevada and New Mexico State Senates and Nevada State Assembly. Hinduism, oldest and third largest religion of the world, has no datable beginning but some scholars put it around 3,000 BCE. It has no founder, no one authoritative figure, and no single prophet or holy book. One of its scriptures, Mahabharata, is the longest poem ever written, comprising over 100,000 couplets. Hinduism in North America was introduced in 1830s with Ralph Waldo Emerson and Henry David Thoreau studying Hindu scriptures like Upanishads and Bhagavad-Gita. Vivekananda made a strong impression at World’s Parliament of Religion in Chicago in 1893 and he then founded Vedanta Society. Protap Chunder Mozoomdar of Brahmo Samaj delivered his first American address on September 02, 1883 in Concord, Massachusetts. Colorado State Senate is composed of 35 members, with each district having a population of about 123,000. Colorado has the highest mean elevation of any state of USA, with more than 1,000 rocky peaks over 10,000 ft high and 54 towering above 14,000 ft. Breathtaking scenery and world-class skiing make Colorado a prime tourist destination.